We also provide a Newborn Hearing Screening programme, with further diagnostic testing and work closely with our local community and education services, in providing a full comprehensive paediatric (children's) hearing service. ClinicalWe can usually see you within 3 weeks of receipt of your referral and if appropriate, following testing, we then fit you with a hearing aid(s) within 4 weeks. Please see the referral information section below for further information on how to be referred to our services. The department consists of 23 staff, comprising of highly experienced and specialisedAudiologists, Assistant Audiologists, Newborn Hearing Screeners, Clinical and Clerical Support Staff. The department is also a recognised training centre for the University of Manchester, where students are placed to gain valuable clinical experience. If you already have a hearing aid and require replacements batteries, find out where you can get batteries by clicking on the town name below. Tinnitus is the perception of noises in the head and/or the ears which has no external source. It is not a disease or an illness, but is a symptom generated within the auditory system. Patients referred for tinnitus therapy must first be seen by an Ear, Nose and Throat Specialist. This consists of a clinical ear examination, full medical history being taken, a full hearing test as well as arrangements to be made for any other appropriate tests to be carried out. Patients may then be referred onto the Department of Audiology for further help in managing their tinnitus. 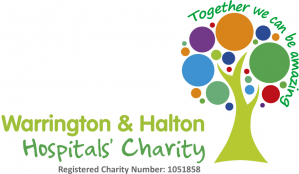 The Tinnitus Therapy Clinic at Warrington and Halton Hospitals is a well-established service. It is delivered by competent and experienced tinnitus therapists, who will initially carry out a detailed assessment appointment. During this assessment, patients will also be asked about the impact of their tinnitus on their emotions and lifestyle. They will also be informed of the physiological and emotional mechanisms of tinnitus, and how best to manage their symptoms. Sound enrichment therapy, such as hearing aids (if applicable), CDs, sound enrichment balls, environmental sounds andTinnitus-related Apps (for smartphone users). Balance disorders can be extremely uncomfortable and debilitating. We offer a comprehensive investigation service for patients, suffering with dizziness and balance disorders. The balance system is a 'tripod system' of sensory information. It is the co-ordination of information from: the visual system, the proprioceptive system (information about positions, from your feet, limbs and joints) and the vestibular system (information from the balance organs in the middle ear). The brain processes the information from all these systems and ensures that the muscles in your limbs and eyes respond correctly when your balance system is challenged. For example: You are walking along, when suddenly you trip over a stone. Your balance system reacts to ensure that you do not fall, and makes corrective movements with your limbs and eyes. Vertigo (an illusion of movement), dizziness and balance problems arise when there are problems in one of more of the systems involved in balance. It is important that the cause of dizziness be determined by professionals. If you think you have a dizziness problem, please contact your GP and ask them to refer you to an ENT doctor at Warrington and Halton Hospitals NHS Foundation Trust. The doctor will assess you condition and request Vestibular Function Tests, if required. Hearing loss can be due to the aging process, exposure to loud noise, certain medications, infections, head or ear trauma, congenital or hereditary factors, diseases or a number of other causes. How do I arrange to have my hearing checked? If you feel that your hearing has deteriorated and you would like your hearing checked, please contact your GP, who will refer you for a hearing asssessment. If you already have a hearing aid from our department please contact us directly to arrange a hearing re-assessment. You should make sure that your ears are clear of any wax. If in doubt, consult your surgery. Ears blocked with wax may give inaccurate results for your hearing test and it may not be possible to take an impression of your ear, if needed. We are happy for you to bring a friend or relative, along to the appointment with you. What will happen at the assessment appointment? The Audiologist will ask questions about your medical history, lifestyle and assess the impact any hearing problems are having on your life. The Audiologist will then examine your ears, to check for any abnormality and then a thorough hearing test will be performed. Once testing is completed, the Audiologist will explain the results to you and recommend the best course of action. If a hearing aid is recommended, an impression of your ear may be taken and your fitting appointment will be made. If it is found that you need a hearing aid, the department issues digital hearing aids routinely, and they are behind-the-ear style (BTE). The hearing aid will be specifically programmed to your hearing loss and can be adjusted to best suit your preferences and needs. The sound quality produced by digital hearing aids is significantly better than that of older analogue hearing aids. Also, digital hearing aids do not cut out all background noise, but aim to reduce the level in different listening situations. When the hearing aid has been fitted and you are happy with the sound, the Audiologist will show you how to operate the hearing aid, replace the battery, clean the hearing aid and make sure that you are confident in fitting it yourself. You will also be given information regarding where to obtain batteries, which are free of charge for NHS hearing aid users. Please click here, for further information on how to get the best out of your hearing aid. 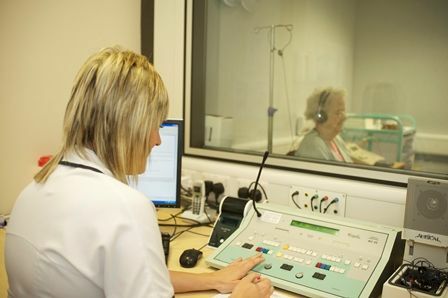 For patients who already have a hearing aid from us, requiring a fine-tune appointment or hearing test, please contact the department for advice on how to arrange this on 01925 662420. Warrington Audiology: Monday to Friday, 9am-4pm. Halton Audiology (Clinic C): Wednesday, 9am-12pm. Or via one of our Community Clinics: click here.